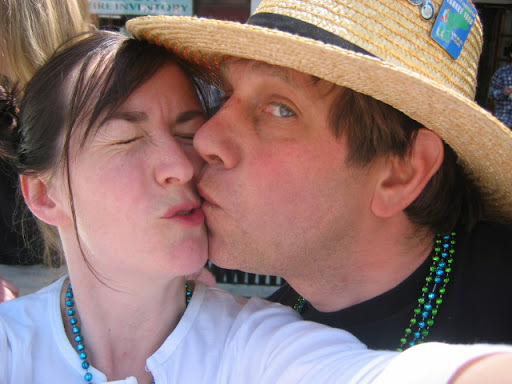 Northampton Honey: Our Marketing Strategy! 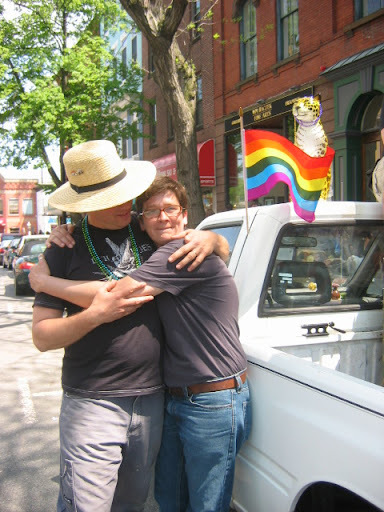 Preservation Honeybee took their show on the road last weekend to the Northampton Gay Pride Parade. 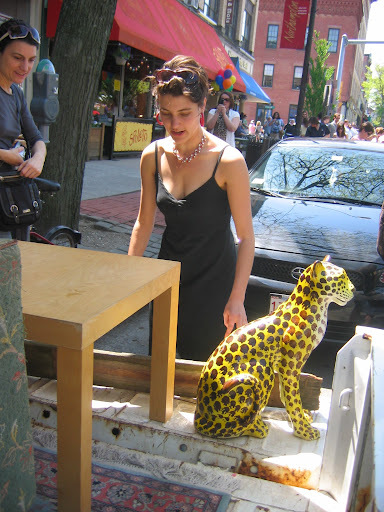 We loaded a couch, oriental rug (fake), an Ikea end table, a silver platter (fake), recycled glass pitcher, some glasses and our beloved ceramic cheetah and headed the .45 miles to Main Street Northampton. For "marketing" purposes we stenciled "preservationhoneybee.com" onto two weathered boards we had and balanced them on the truck. 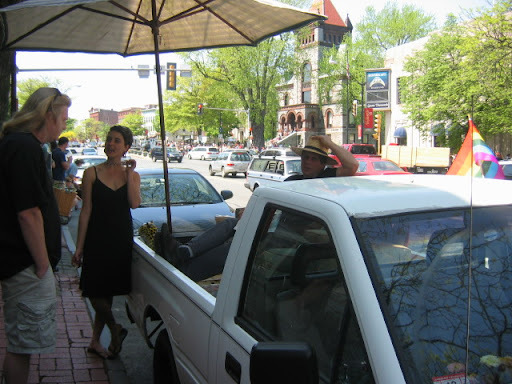 Our friends Sara and Tom hang out at Preservation Honeybee world headquarters, a 1991 Isuzu pickup truck in front Amanouz Cafe on Main Street Northampton. Sara admires our board with Preservationhoneybee.com stenciled onto it. 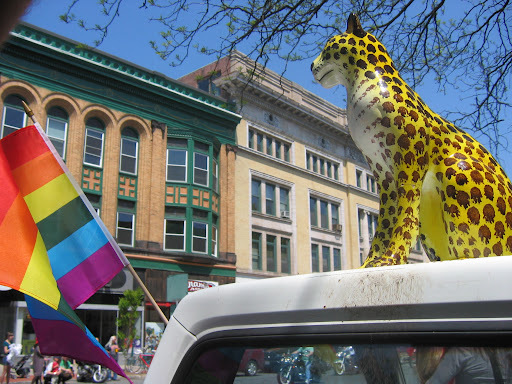 Here the Ceramic Cheetah espies Loreli Eresis AKA Ms. Trans Northampton, who has offically endorsed our Honey. I am not kidding. When it comes to marketing this is how we roll! Her truck looked almost as crappy as our truck. 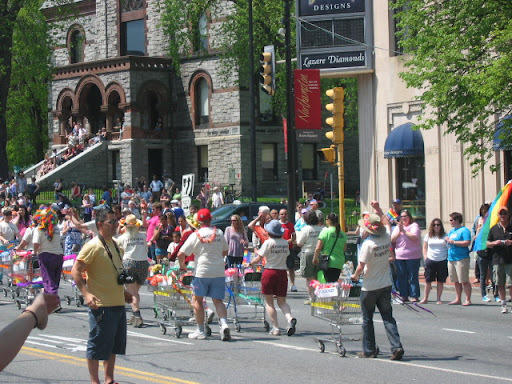 Lots of potential customers including this synchronized marching shopping cart posse from River Valley Market. 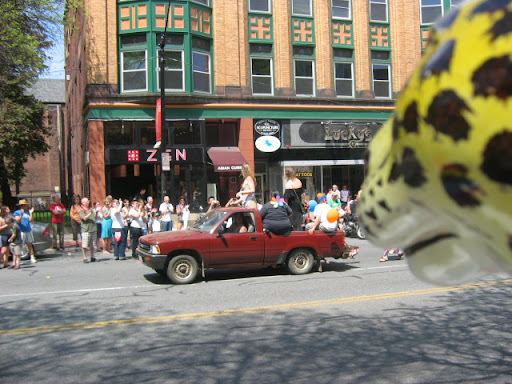 Here the Ceramic Cheetah overlooks all that is wonderful that day in Northampton. 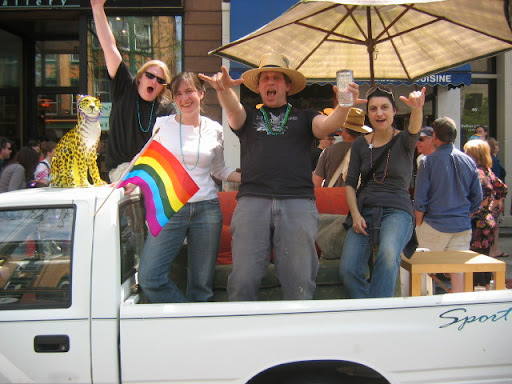 Our awesome crew: Cheetah, Tom, Priscilla (AKA Queen Bee) and Adam (AKA Drone)with special guest Sally. 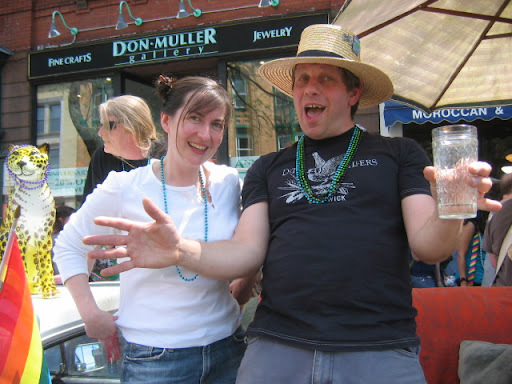 Here I engage in "extreme marketing" where I try and hug each potential customer, in this case my hometown friend, Casey. Here the controlling interest in Preservation Honeybee have high level talks on corporate strategy. He hope you enjoyed this look inside the machine that is PreservationHoneybee.com. We actually can make you a t-shirt if you want one. We have a t-shirt sized stencil.